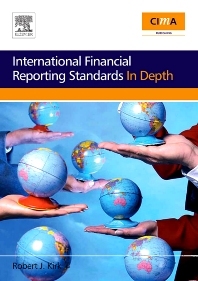 This book reflects IFRS as of the preparation of the text during 2004, and as far as possible up to the date of first publication in July 2005. The book starts with an introduction to the standard setting process, as well as looking at the development of IASB. It examines the framework for the preparation and presentation of financial statements which underpins the practice of financial accounting. The intention of the book is that the reader will be tested on basic numerical application, on an understanding of the underlying theory, and on presentation of financial statements under the international regulatory framework. The questions have been carefully chosen to test the readers ability to write good practical reports, perform calculations, and present both extracts and full sets of financial statements. Accountants, finance managers, students of accountancy, finance and management. Robert Kirk BScn (Econ) FCA CPA qualified as a charted accountant in Belfast with Price Waterhouse & Co., and spent two years in industry and a further four years in practice. In 1980 he was appointed director of a private teaching college in Dublin where he specialised in the teaching of financial accounting subjects. He later moved into the university sector and is currently Professor of Financial Reporting in the the School of Accounting at the University of Ulster. He also presents continuing professional education courses for various institutes across the UK and Ireland.